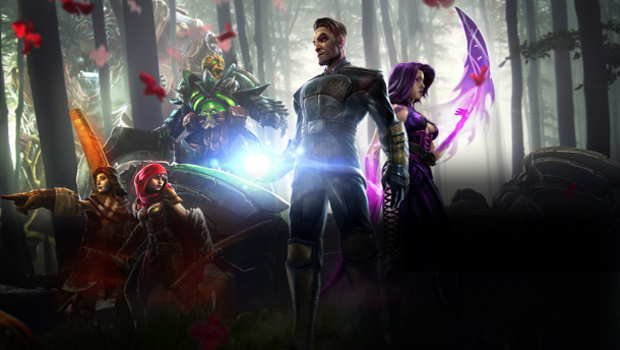 Dawngate is the first MOBA made by Waystone Games, a development studio to have the misfortune to be owned by EA. 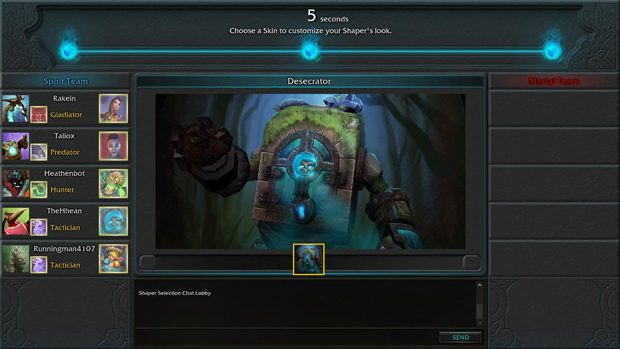 While many MOBAs in the past were using DOTA as a base template, Dawngate has been influenced more than a little by League of Legends. The game invites comparison before you’re even in a match, as the game’s client is a similar floating window with a near identical layout to the one LoL uses. When getting into the game itself, the similarities make themselves even more apparent; There are summoner spells (many of which are exactly the same, others which act like LoL’s support items), brush and a level cap of eighteen. 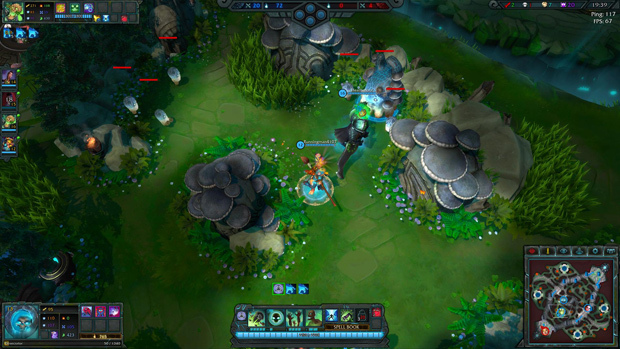 There’s even subtle nods to LoL in the game’s colour palette and character movement speeds. Before declaring this yet another monstrosity emerging from EA’s cloning vats though, Dawngate has plenty of fresh ideas to set it apart from its forebears. The most notable of which is the game’s unique map. 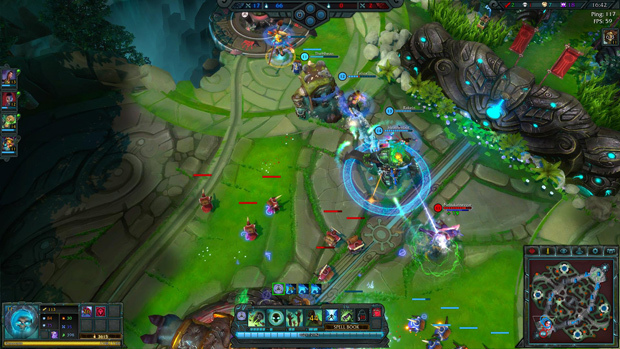 Its most similar cousin would be LoL’s new Twisted Treeline, but rebuilt from the ground up with five players in mind. It has two lanes, with a central boss monster and four altars in the corners. These altars function much like the gold mines in an RTS, giving your team a steady stream of income while a band of NPC workers move back and forth between the altar and some rocky outcroppings. They can be captured by standing on them, but the minions can also be killed for fun and profit. This can create some great play and counterplay, as leaving a lane to try and take an altar while you think the enemy can’t retaliate (due to them ganking another lane or you straight up murdering them) sets you up with not only a good bit of upfront gain, but also a steady stream of profit thereafter. Misjudge your enemy though, and you’ll not only lose farm from your lane, but they’ll get an easy kill while you’re so far from towers. Only Dawngate doesn’t call its defensive structures ‘towers’. Bindings, as the game calls them, don’t just spew laser death at your enemies. 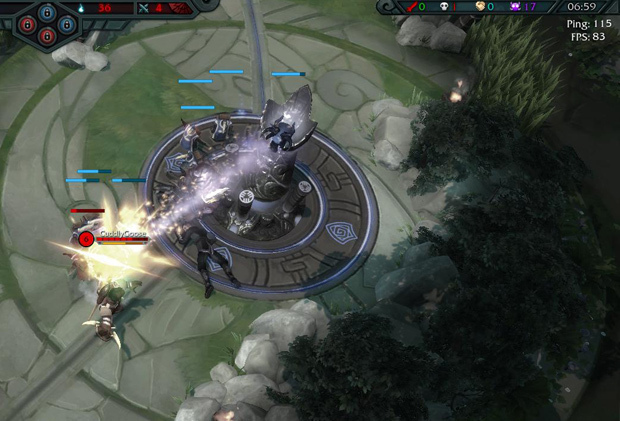 If your team drops an enemy team’s, your own team’s siege minions will be slightly upgraded in that lane, getting better upgrades as each tower falls. This sounds like it should snowball the game quickly, but each successive binding is far stronger than the last, with the final one in a lane capable of murdering anything that dares approach. These bindings also will respawn over time, allowing for late game comebacks if you can hold out long enough to get your defenses back in order. 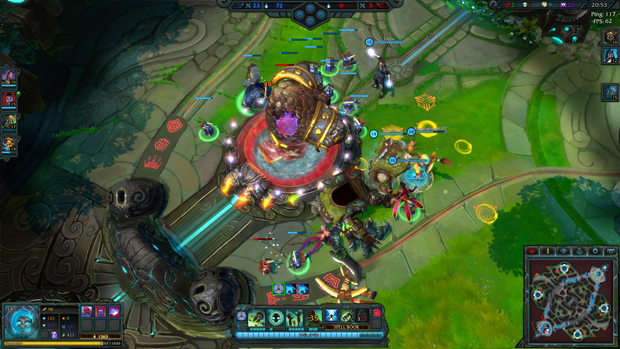 The win condition of the map isn’t simply destroying an inanimate structure, but to slay a towering monstrosity in the enemy team’s base. Since this monster will be tough as nails to bring down, it means that even if you’re absolutely wrecking an enemy team early on, you’ll still need some levels and equipment to take it down, buying them time to get their bindings back up. While this same system was found in SMITE, the combination with the bindings respawn timers is a great combination that allows victory to be possible even on the brink of defeat, even if it isn’t very likely. 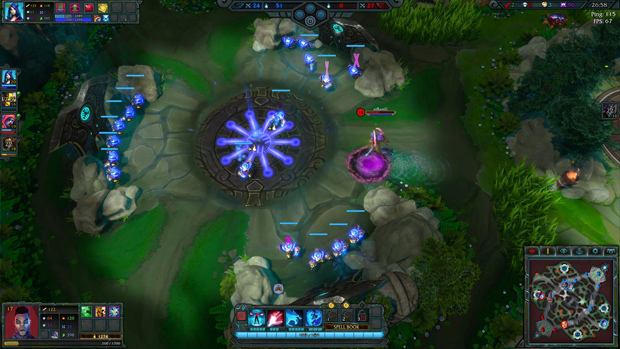 Cooldowns are short, ranging from five seconds to a minute. Most characters don’t even have a resource to manage, so there’s little reason not to keep spamming attacks at the enemy. While this may take away some of the tactical depth of the game (and that’s only a maybe), it feels good to know you’ll always have your character’s tools at your disposal rather than feeling the frustration of saying “I could have killed him if I hadn’t just run out of mana there!”. The main problem I see right now though is that crowd control effects are currently very strong, since even though they’re on a short duration in Dawngate, you can keep throwing abilities at them until they’re locked down long enough to be killed. Another good bit of streamlining is that wards are free. Every member of a team gets a single free ward to place, but they can’t buy any others. This means that no-one on the team will have to act as a traditional hard support, spamming wards across the map. Instead, it’s the job of every member of the team to fight back against the fog of war. 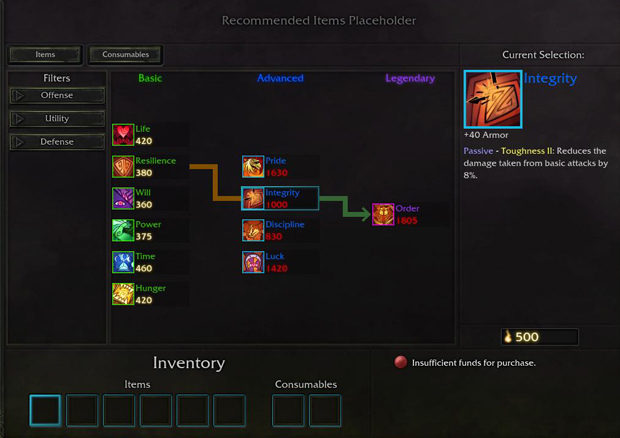 Consumables also have their own inventory slots, meaning they don’t become unusable in the late game when you’re approaching build completion. Due to the unusual two lane map and no need for a ward monkey, the game doesn’t use the usual MOBA roles. The game does have archetypes though, a role selected at the start of a match that changes how your character will gain an income during a match. Gladiators fill the usual carry role, gaining increased gains from last hitting minions. Strategists are the closest thing the game has to a support role, gaining benefits when a minion wave dies near them, without the need to last hit. Unsurprisingly, many teams run with both of these two in the lane together at the same time. Hunters gain benefits from jungling, and Predators gain additional benefits from murdering people. It’s an interesting choice to avoid the normal names for these roles (Carry, support, jungler and ganker), and maybe implies that Waystone Games hope to see a more flexible metagame in their title. The starting meta in the game seems to be two players in a lane with a roaming jungler, but perhaps things will open up when players have more than an evening to play with the game. 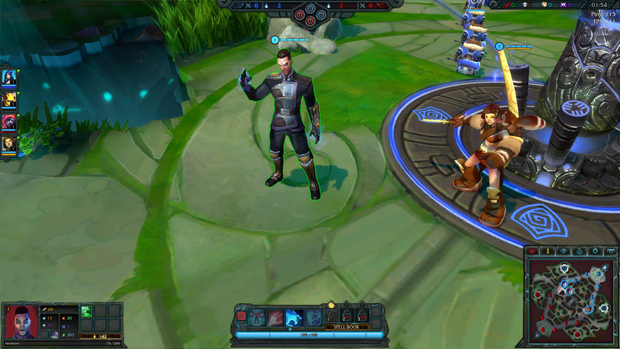 In addition to the archetypes, a player can modify their character with perks in a similar fashion to the runes from League of Legends. However these are fixed sets of stat blocks that are available to the player right from the get go rather than a set of modular sockets. While developer videos have implied that they intend for these to be customisable at release, I actually prefer the system as it stands right now. The system is quick to get going, adds some depth and character customisation without LoL’s grind or its tendency to get mired in page after page of mathematical calculations. The game looks and sounds great, with no load screens to boot. I can only assume the game offloads the load times into the character selection process itself, making the game feel incredibly smooth. The character designs vary from bland to insane, with a good deal more of the latter than the former. The mechanical character kits seem solid, with a good deal of internal synergy. While the cast is currently on the small side, that no doubt will change as the game approaches release. 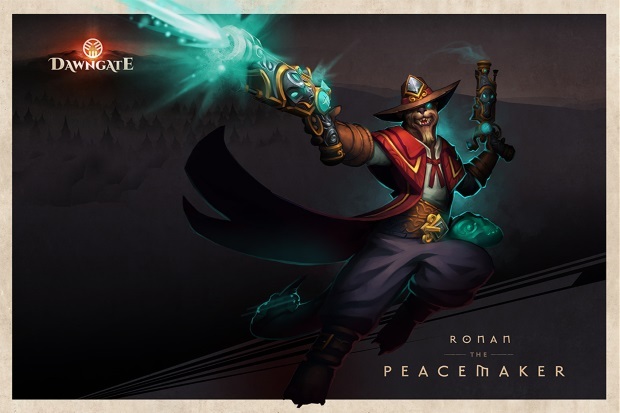 After just a short time with Dawngate, I can say it looks to have plenty of potential. While it’s not likely to take the top spots from Dota 2 or LoL, it looks like a solid product that iterates on a well-known formula while bringing plenty of its own ideas to the table. Very enthusiastic about seeing more of this game in the future. A quick correction on my article. It’s been pointed out to me that the max level is 20, not 18. So the levelling is different from LoL.